Hitch’s 2nd best film is a master class in slowly building dramatic tension by letting the audience discover clues as the protagonist does. 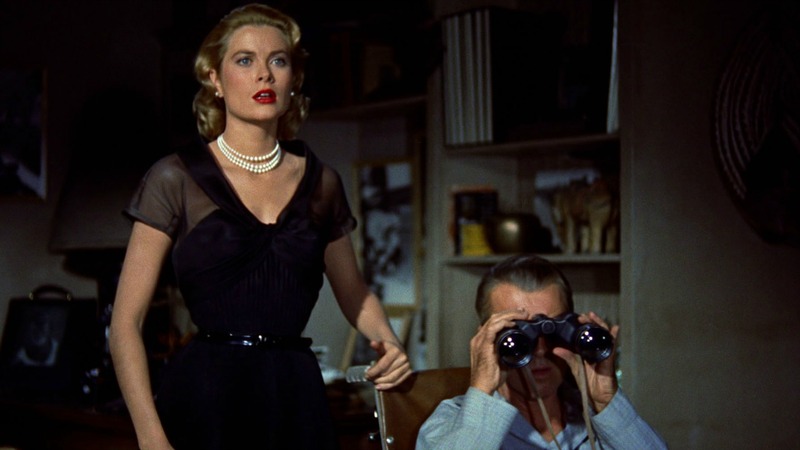 I got the unexpected opportunity to see Rear Window on the big screen this week. While I’ve seen it a number of times, I had never seen it like this. No matter how great our at home systems get, there is nothing like seeing movies projected against a huge screen. Even if I one day get to build my ideal home theater, I can’t imagine that it will ever match the immersive experience that comes with entering a dark theater, turning off the outside world and being surrounded by the experience that the filmmaker intended. Aside: Although I could do without the damn commercials. It’s a simple equation: tv is free (theoretically at least) so I have to sit through commercials – that’s my charge; I pay for movies so I don’t have to watch commercials. They’ve changed the implicit contract, something that makes me threaten to stop going to the theater every time. Every movie gets better when it goes up on that screen on the wall, even if some movies aren’t going to be any good no matter what. When you’re seeing a classic film, something you originally saw on a tv screen, the experience is often transformative. Sometimes you notice new details that simply were lost with downsizing. Often there is a quality improvement as screenings frequently involve a restoration. But largely the grandeur and scope are simply the elements that are restored, just by virtue of commanding your scattered attention in an increasingly distracting world. 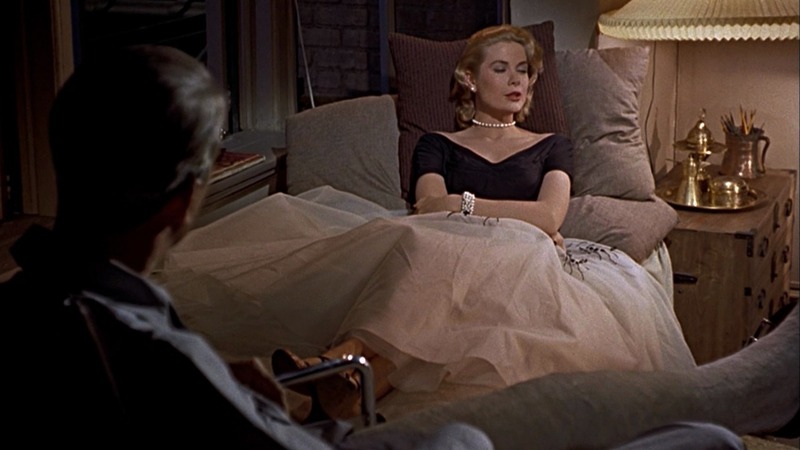 Rear Window really benefitted tremendously from a theatrical presentation. Many writers more insightful than myself have explored Hitchcock’s themes with this picture: putting the protagonist in the place of the audience and vice versa, the relationship between Jeff & Lisa being reflected in the other relationships visible through the window, etc. I won’t subject you to my own dog-eared analysis, other than the cynical observation that Hitchcock was too pragmatic of a filmmaker to waste time with all this literary nonsense – I think he just liked making crime pictures. What is true is that watching the film theatrically really accentuated this idea of the film screen being the window pane. In all of the movie I can recall only a couple of instances of actors looking directly at the camera, and at those times it is clear that the camera is from Jeff’s POV. Watch the behavior of any of the visitors to Jeff’s apartment; they all approach the edge of the room, standing back from the enormous windows as if walking up to a wall-sized mural and trying to focus on an unreachable detail while still seeing the whole painting. The lighting is key; while never looking at you, you really feel the characters are stepping forward to better see through the screen that doubles as the window pane. 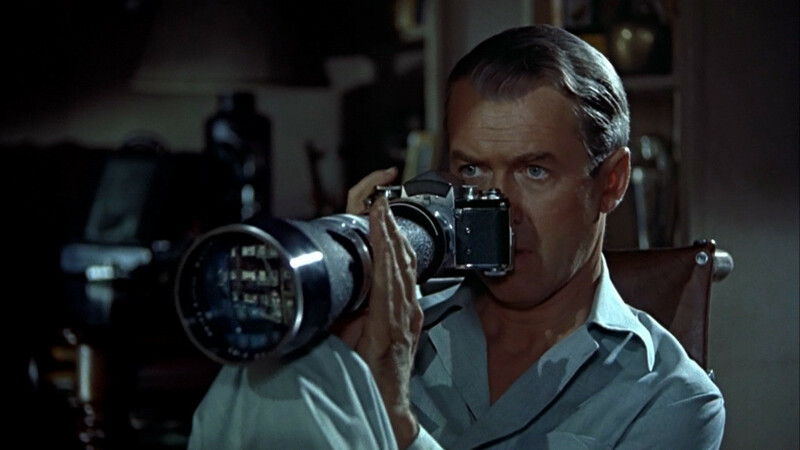 While the production is brilliantly confined like Jeff (Jimmy Stewart) to his apartment, and is staged as if it were a play, Rear Window truly is a film experience. 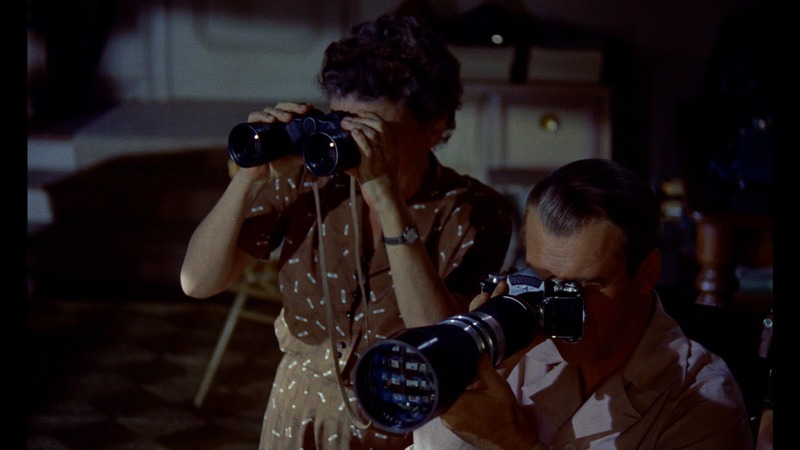 Hitchcock tantalizes you with this panorama of interesting characters, but controls your view to the spectacle, as if someone else were in charge of moving your telescope for you. Jeff falls asleep, loses attention, fails to notice details – it’s a very human account of the story. He’s not an omniscient observer and so you cannot be. The casting is truly inspired. Jimmy Stewart in his 2nd of 4 Hitchcock movies provides his usual down-to-earth everyman who is so genial and Jimmy Stewarted that you don’t think he’s a creep for peeping at his neighbors all day. Which he is. Grace Kelly. 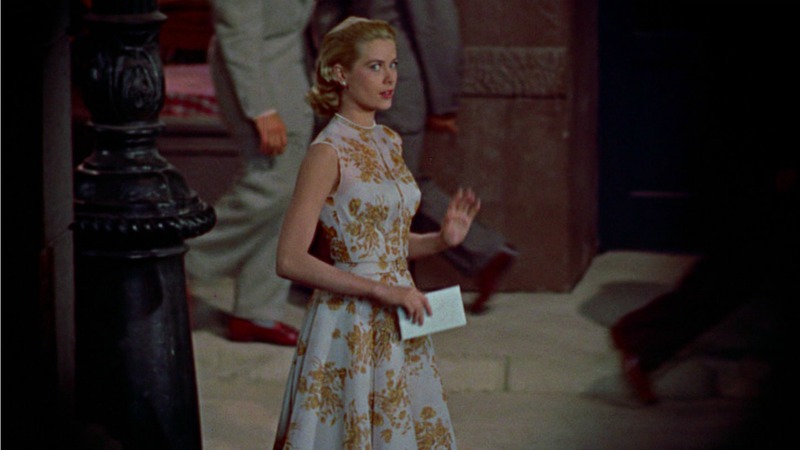 Ah, Grace Kelly. Her second and best Hitchcock film role gives her a little more edge than in Dial M for Murder. But mainly she shows inner strength as Stewart’s Girl Friday and wears Edith Head’s designed clothes as no one else before or since. Thelma Ritter adds some comic relief, filling out the main cast. Raymond Burr adds a bit of menace, even if he was cast mainly because he could easily be made up to look like producer David O. Selznick, whom Hitchcock disliked. Based on the short story “It Had To Be Murder” by Cornell Woolrich, John Michael Hayes (pride of Worcester, MA) penned the screenplay, the first of four straight he did for Hitch. The Franz Waxman score is wonderful as always, even if there really isn’t much of it. Hitch wanted all the sounds of the movie to be diegetic – the sounds of what you saw happening. 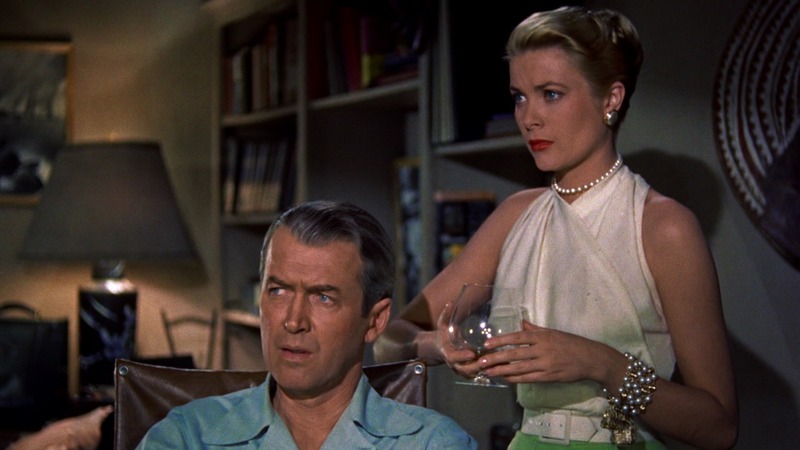 I believe Rear Window is second only to Vertigo in Hitch’s collected works. The story is grounded in reality, the tension is excellent, the dialogue wonderful and it has Grace Kelly. Plot A wheelchair bound photographer spies on his neighbours from his apartment window and becomes convinced one of them has committed murder.